riental’s Farmers’ Market happens every Saturday on Hodges Street between South Water Street and the Oriental harbor. We’re open from 8:30a to 11:30a. Be sure to check out Row Two — we’ve grown so much that one row wasn’t enough. Often for sale at the market are eggs, honey, jewelry, soap, baked goods, chocolate, produce and artisans work. The Oriental Farmers Market set up on Hodges Street in July 2007. Today, we have a market that is appreciably bigger than it was when it started with just three vendors back then. Come by and see for yourself. And now, a few humble requests. 2) There should be plenty of parking available on Hodges – from the harbor to Academy Street and on South Water Street. Unless you’re planning to be shopping inside the Provision Company please don’t park in the spaces directly in front of or beside that building. Those spaces are needed for the Provision Company customers and everyone wants to be a good neighbor. So, please, park there only if you plan to shop there. And please do not park in front of the booths – it makes it a challenge for other customers to walk by. Thanks for support your Oriental Farmers’ Market. Looking for Organically Raised Chicken and Meat in Oriental? One more note: organically raised meats and poultry are easier to get in Oriental now. You can have your organic meats and get them delivered, too. A big “Thank You” for nurturing our grassroots…. The Oriental Market has been a truly grassroots effort since its start in July 2007 and we remain a grassroots effort. We get no funding from any source other than you when you come to the market. Now in to our eighth year, we send a big thanks to you for your support…. If you’re new to us, and if you are looking for locally grown, locally made food, some introductions are in order. Namely, we are as local as you are going to get, unless you grow it yourself. Throughout the year — all 12 months — you’ll find produce grown in gardens in Oriental and Pamlico County. Eggs laid by Pamlico County hens. Breads and other baked goods coming from local ovens. As well as plants and artisans’ work…. Most of our growers raise their produce without chemicals. Find out for yourself. Come on down and talk to the people who grow the food and ask them how they grew it. That’s the beauty of the Oriental Farmers’ Market. You can also ask about the chickens that lay the eggs and the baked goods that come from Oriental and Pamlico County kitchens and the artisans’ work and the plants…. 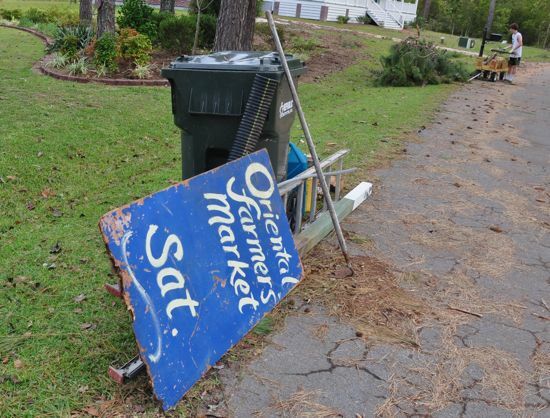 The Oriental Farmers’ Market sign floated away in Hurricane Irene from its usual position outside the Wits’ End on Hodges Street. During the storm surge, it floated away and away and away and came to rest in a backyard in the SailLoft subdivision on the other side of the bridge. It’s since been returned to its home. 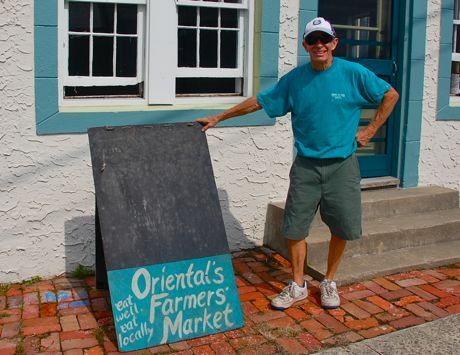 Our other Oriental Farmers’ Market sign came back home in late September, thanks to Bill Manger who found it while clearing trees near a friend’s home at Otter Creek. After floating 8/10ths of a mile away in Irene, the sign is a little heavier — with all the absorbed water — and needed a wash, but it’s back on Hodges Street to again let passersby know about the market. 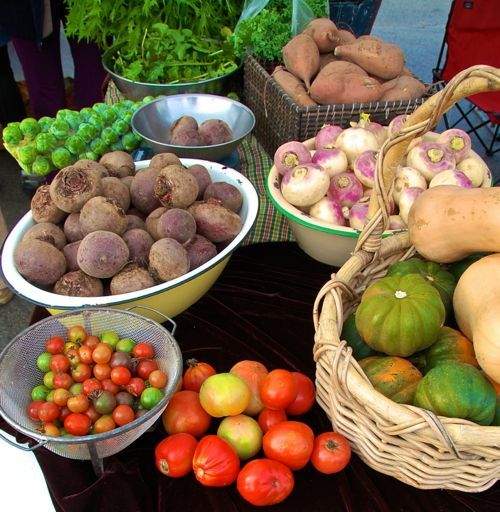 We welcome you to sell at the market if you have something that is locally made or locally grown. Basically, our key criteria is “local, local, local.” If it’s locally made or locally grown, you can bring it to the market to sell. If you’re baking or preparing food to sell, there are some other NC Dept of Agriculture standards to meet — for instance, a kitchen inspection . You can read more about that here. 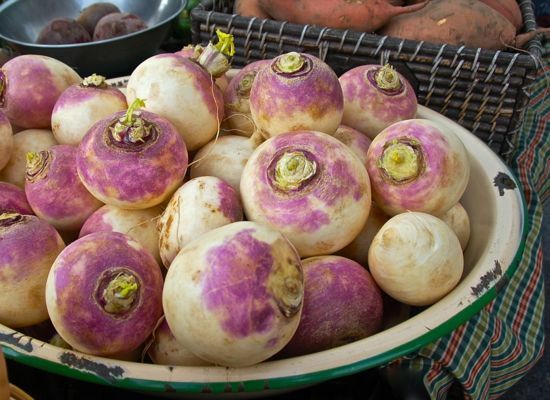 We also welcome your ideas of food-plant-craft related demonstrations to happen at the Farmers’ Market. For more info, call Melinda at 675-0180.